We thank the curators of the herbaria A.A.U., B.R., G.B., K., S., P. and U.P.S. for loan of herbarium material, biomedical technicians Anbar Khodabandeh (Bergius Foundation, Royal Academy of Sciences) and Keyvan Mirbakhsh (Stockholm University, Sweden) for assistance, Jürg Schönenberger (Stockholm University) for suggestions for improvement of SEM investigations, Charlotte Taylor (Missouri Botanical Garden) for sharing unpublished information on Dunnia sinensis, Peter Endress (University of Zürich), Jan-Thomas Johansson, Per-Ola Karis (Stockholm University), Elmar Robbrecht (National Botanic Garden, Belgium) and an anonymous reviewer for valuable suggestions and comments on the text. The study was supported by grants from the Swedish Research Council to C.R. and B.B., and from the Knut and Alice Wallenberg Foundation to B.B. Appendix: F amily —R ubiaceae J uss . Tribe Luculieae Rydin and B. Bremer, tribus nov. Diagnosis: Arbuscula. Calyx 5-merous, corolla 5-mera, tubo longo vix supra dilatato. Flores heterostyli. Antherae intra tubum subsessiles semiexsertae. Stigmata 2, ovarium 2-loculare, loculis polyspermis. Fructus baccatus, semina minuta. Description: Small trees or shrubs, opposite phyllotaxis. Stipules deciduous, lanceolate to linear. Flowers large, showy, pentamerous, heterostylous. Stamens inserted in narrow corolla tube, filaments short. Ovary bilocular, fruit baccate, seeds small, numerous. 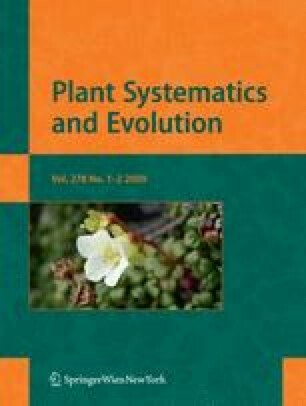 Useful publications: Murray (1990); Bremer et al. (1999). Description: Sparsely branched subshrubs or vines. Flowers usually pentamerous (rarely 4 or 6 parted). Ovary bilocular, fruit a capsule, seeds numerous. Chromosome basic number 10–11, Acranthera x10 (Kiehn 1995), Coptosapelta x11 (Verdcourt 1958; Puangsomlee and Puff 2001). Note: The new circumscription is based on molecular evidence presented in this paper. Morphological synapomorphies are not known at this point. Genera included: Coptosapelta Kort., Acranthera Arn. ex Meisn. Useful publications: Alejandro et al. (2005); Verellen et al. (2004); Puangsomlee and Puff (2001); Bremer et al. (1999); Kiehn (1995); Puff et al. (1995); Bremekamp (1947); Valeton (1923); Rydin et al. (this study). S ubfamily —R ubioideae V erdc . Tribe Colletoecemateae Rydin and B. Bremer, tribus nov. Diagnosis: Arbores vel fructices, stipulis integris. Inflorescentiae axillares floribus multis conglomeratis. Flores heterostyli, 5-meri. Calyx cupuliformis, corolla tubiformis, stamina filamentis longis sub sinibus corollae adfixis. Ovarium 2-loculare, ovulo 1. Fructus drupaceus, pyrena 2-loculare, semina albumine satis molli et oleoso, embryo teres. Description: Small trees or shrubs. Inflorescences axillary, flowers pentamerous, heterostylous. Stamens inserted in corolla tube. Ovary bilocular, one ovule per locule. Embryo long and narrow. Fruit a drupe, pyrenes bilocular. Useful publications: Petit (1963); Piesschaert et al. (2000a); Robbrecht and Manen (2006); Rydin et al. (2008). Schizocoleeae Rydin and B. Bremer, tribus nov. Diagnosis: Arbuscula. Stipulae in vaginam longam et angustam in fimbrias plerumque 8 fissam connatae. Flores in axillis foliorum dispositi. Calyx 5-merous, lobis e basi triangulari-setiformibus, hirsutis. Corolla hypocrateriformis, tubo calycem longitudine multo excedente. Stamina parte dilatata tubi inserta. Ovarium biloculare, loculis septo tenui separatis. Fructus baccatus, monospermus. Description: Small trees, stipules bordered with fine hairs. Flowers pentamerous, calyx triangular at base. Corolla extends beyond calyx, stamens inserted in corolla tube. Ovary bilocular with thin dissepiments separating the locules. Fruit a berry, one-seeded, surmounted by persistent calyx. Useful publications: Bremekamp (1950); Razafimandimbison et al. (2008); Rydin et al. (2008). Dunnieae Rydin and B. Bremer, tribus nov. Diagnosis: Frutex. Inflorescentiae terminales, cymosae, floribus multis conglomeratis, bracteis magnis albis circumdatae. Flores 5-meri, calycis lobi minuti, persistentes. Corolla tubiformis, tubo calycem longitudine multo excedente. Fructus capsularis, 2-valvis, valvis 2-partitis. Semina numerosa. Description: Woody shrubs, stipules pubescent. Inflorescences terminal cymes, surrounded by enlarged, petaloid bracts. Flowers pentamerous, corolla tube extends out of calyx. Stamens inserted in corolla lobe. Pistil distylous. Fruit a capsule, seeds numerous. Diagnosis and description are based on the original publication of Dunnia (Tutcher 1905) and on observations made by C. Taylor (Missouri Botanical Garden, pers. com.). Useful publications: Tutcher (1905); Ge et al. (2002); Chiang et al. (2002); Rydin et al. (2008).